Atlanta, GA, (Mar. 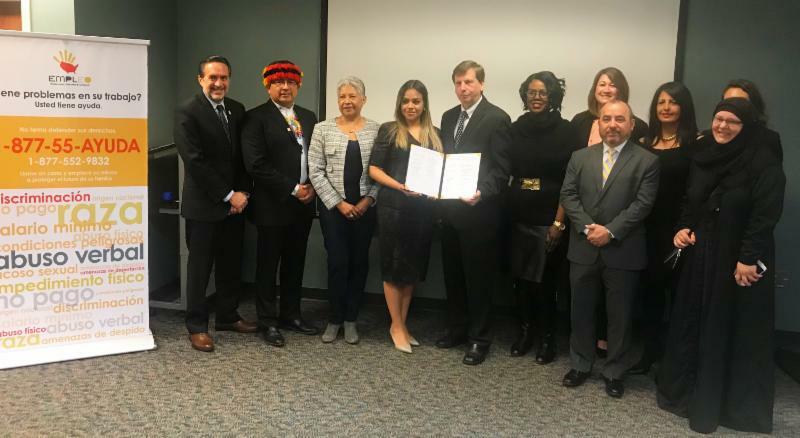 7, 2018) – The Latin American Association (LAA), the Department of Labor’s Wage and Hour Division, nonprofits and local and state agencies officially signed the EMPLEO (Employment Education and Outreach) alliance yesterday at the LAA’s headquarters in Atlanta, Georgia. Officially launched in 2004, the EMPLEO program represents an alliance of community and nongovernmental organizations along with state, local and federal agencies, and the Central American and Mexican consulates that will provide free information and assistance to Spanish-speaking workers and employers regarding their workplace rights, responsibilities and employment related issues in the U.S. Since its inception, the program has served immigrant workers and employers in Southern California, Washington, Nevada, Oregon and Idaho, and its 1-877-552-9832 toll-free assistance hotline has been instrumental in helping approximately 11,000 workers recover more than $16 million in back wages. Founded in 1972, the Latin American Association (LAA) is a 501 (c)(3) nonprofit organization serving the Latino community in metro Atlanta and surrounding areas throughout Georgia. The mission of the LAA is to empower Latinos to adapt, integrate and thrive. Our vision is ‘Opportunity for All’. Core programs and direct services offered include family services, youth programs, workforce development and employment services, immigration legal services and advocacy. The LAA is one of only two nonprofit legal services providers in Georgia serving the Latino community.